plusieurs: several, a number of, a lot of. pour l’instant: for the moment, for now. plein: full. Plein de: full of. A number of other senses–follow the link for more. la copie de travail: working copy. le dépôt: in this sense, repository. la zone d’attente: in this case, staging area. More generally, a waiting area. le titre du commit: title or heading of the commit. le chemin relatif: relative path. la constitution: many senses–I think that here the relevant one was the creation or setting up of something. le commentaire: comment. I’m happy to say that there was a lot of emphasis on good comments (another software engineering technical term–sorry). la ligne de commande: command line. la modif’: seemed to be slang for modification–a change or alternation. le système de fichier: file system. le truc: I’m not sure what this meant. It might have been “trick,” as in a trick for doing something. Truc has many other meanings–follow this link to see them. étouffé: suffocated, smothered, stifled, deadened, muted. I’m really not sure what sense this was used in–maybe what we would call in English “suppressing” output? le cadre: if I had a nickel for every time I’ve heard, and been puzzled by, this word… I still don’t know in what sense it’s used here, but here’s a link to the WordReference.com entry. récupérer: to get back, recover, retrieve. réaliser le commit: carry out the commit (software engineering technical term, sorry). Réaliser can also be to make, produce, or create. soumettre: many senses, but in this sense, to submit, as in submitting something to a repository. annuler: to cancel, delete, undo, annul. mettre à jour: to update. publier: to publish or release. This has a technical meaning in software engineering, and it was used in that sense. France has a highly competitive education system. Your score on the high school exit exam–the baccalauréat général, usually referred to as the bac–does a lot to determine where you will go in your life afterwards. Odd career paths like mine would be even less likely in France than they are in the US. Is man condemned to create illusions about himself? Can we prove a scientific hypothesis? Does historical objectivity presuppose an impartial historian? le dessous: as a preposition, it can mean on the bottom, underneath, under, or below. As a noun, it has many meanings, including the downstairs apartment; bottom or underside; underwear; secrets, what lies behind something, hidden facts. The headline of today’s newspaper story is Les dessous d’une note–good luck figuring out which sense is intended without reading the whole article! la note: a number of meanings, including “note,” but also rating, mark, or grade–presumably the intended meaning here. une épreuve: many meanings–in this case, part of an exam. The article begins Après des épreuves de maths et de physique-chimie jugées trop dures, des consignes de clémence auraient été données aux correcteurs. There are, of course, many other words that Zipf’s Law brings us in the rest of the article, but at least now we can read the first sentence! Almost, at any rate: I can’t even figure out what tense auraient été is, let alone what it means! Brigitte: why are you sitting in the cafeteria this morning? Me: the woman who is my desk is here today. Brigitte: Oh, that’s right—Véronique is here. The desk by the door is free, though. Me: each one is sitting at the desk by the door today. Brigitte: no, there’s no one there. Me: it’s OK—I is leaving early today. Author zipfslaw1Posted on June 20, 2014 July 19, 2014 Tags French5 Comments on I can haz cheeseburger? la prune: plum. At the fruit stand this morning, I just had to point and grunt, because I didn’t know the word. la framboise: rasperry. Some great-looking tarts à la framboise at the corner patisserie. la tomate: tomato. Luckily, there was a sign by the tomatoes this morning, so I didn’t have to point-and-grunt. mûr: ripe, mature. I actually learned this word before coming here, but it sounds just like the word mur (“wall”), and when she asked me if I wanted figs that were mûr, I thought, “what’s a wall-fig?”, until she asked me “are you going to eat them today?” and I figured out which word it was. So, I think that this word merits entry on my list of words that I didn’t know. Zipf’s Law strikes as often in the office as it does anywhere else. Here are some random words from my day. Gaps are due to lunch or to me giving a talk. 11:00 AM le pinaillage: hair-splitting. This came up in an email exchange about the best name for a directory. 11:17 AM à propos de: regarding, about, concerning. Directory names again. 11:24 AM le fichier: a file–in this context, a computer file. 11:36 AM le répertoire: notebook, file; I got this in a UNIX error message about failure of the scp command. 12:30 PM le rappel: reminder, in which sense it was used in email the other day; today, it was used in the sense of the technical term “recall,” which is an important concept in evaluating systems in my field. 16:43 PM: si: I knew this one in theory, but didn’t recognize it in practice until, like, the 5th time in a row that my office mate said it to me. It means “yes,” but something like “on the contrary–yes.” I said that I could ssh from my desktop to a server, but couldn’t scp from the server to my desktop, at which she said si–if you can ssh, you can scp. 16:50 PM: le tableau blanc: whiteboard. 15:49 PM: sauvegarder: to back up, to save (data). My cell phone voice mail has an option to sauvegarder a message. 17:50 PM: la passerelle: a footbridge, gangway, or walkway. It was used in the sense of something that allows you to connect to a remote computer. 17:52 PM: la mise en place: setting up, establishment of something. la chaleur: heat. Everyone talks about how the summer heat is just around the corner. No sign of it yet. la myrtille: blueberry. The crêperie that I went to yesterday had myrtille crêpes. “Myrtle crepes?,” I thought…”Sounds horrible!” Nope–a false cognate. le pot: a variety of meanings. I ran across two in three days. One is of a pot, tub, or jar–I ran into this sense when reading the jar of chestnut spread that I put on my morning tartine when I don’t feel like Nutella. The other sense is of a party with drinks–I ran into this sense when there was a pot at the end of the day of PhD student presentations of their research progress last Friday. le ciron: the best word of the weekend–cheese mite! My latest cheese is Mimolette–specifically Mimolette jeune, a mimolette that has been aged less than six months. Take a look at the picture here–the holes on the crust are from cirons. 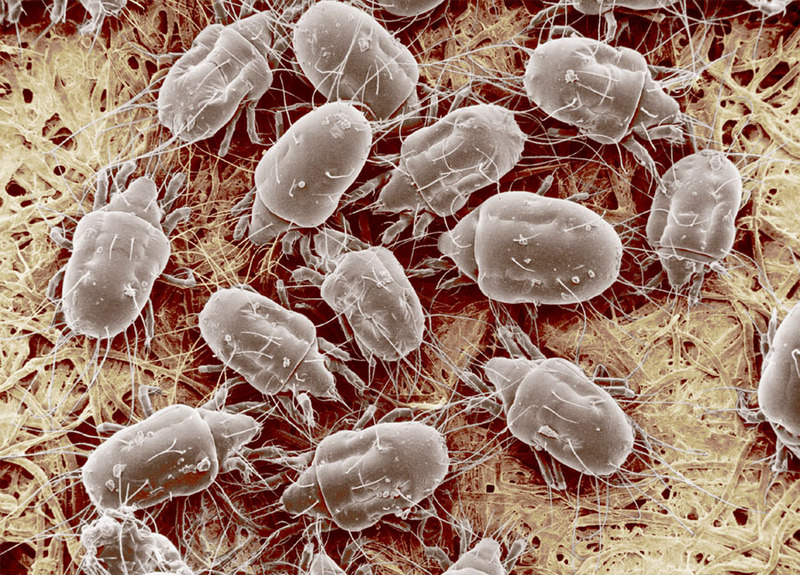 If you are as curious about what a cheese mite is as I was, see here. Mimolette jeune is good, incidentally, and a good cheese for Americans–the flavor is pretty similar to a cheddar. 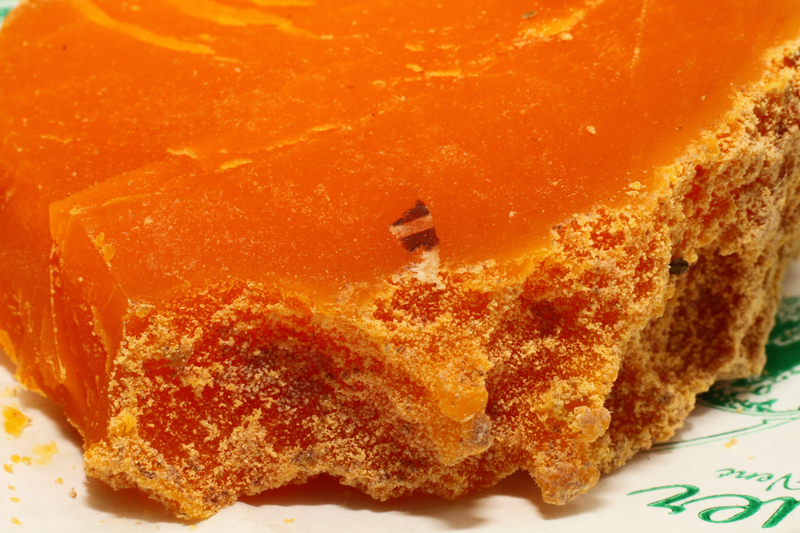 Mimolette, showing the holes in the crust that are caused by cheese mites. 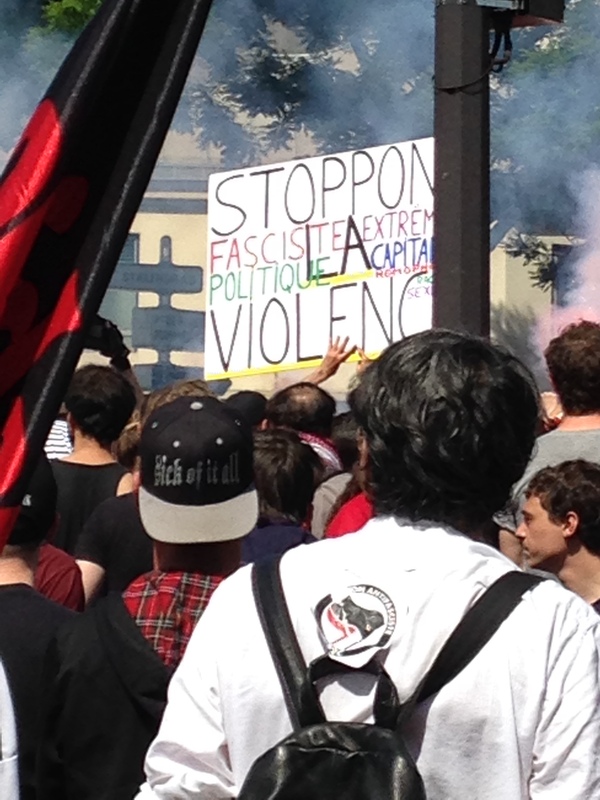 Going to a demonstration in a country where you’re not a citizen and don’t speak the language probably isn’t the brightest thing in the world, but last weekend there was an anti-Fascism demonstration (manifestation anti-fa) in Paris, and I feel strongly about anti-Fascism, so I went and marched. I couldn’t understand most of the chants, but Pas de fachos dans nos quartiers, pas de quartier pour les fachos (“no Fascists in our neighborhoods, no quarter for Fascists”–it sounds better in French than in English, as it plays on two meanings of the word quartier) is about the speed of my French, so I joined in when they chanted that one. 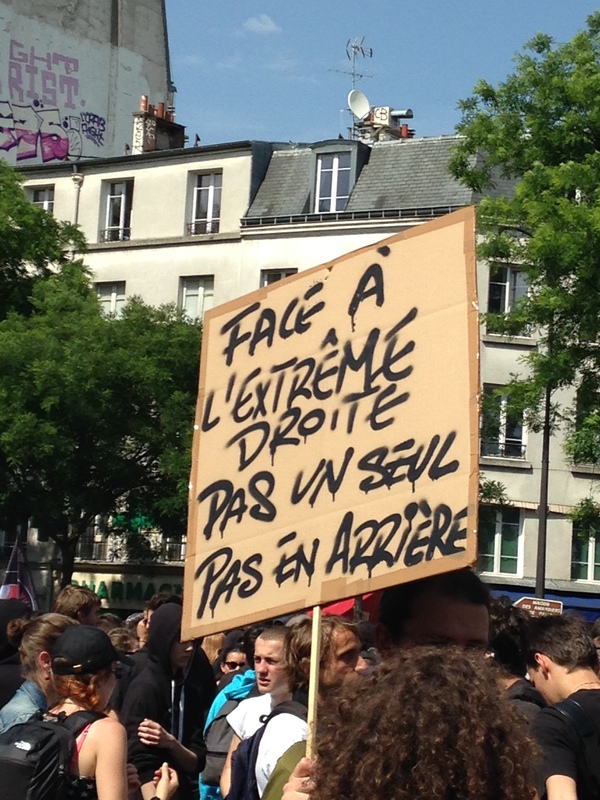 (There’s a similar play on ambiguity in Face à l’extrême droite, pas un seul pas en arrière–“confronting the extreme right, not a single step backwards,” which plays on two meanings of the word pas.) 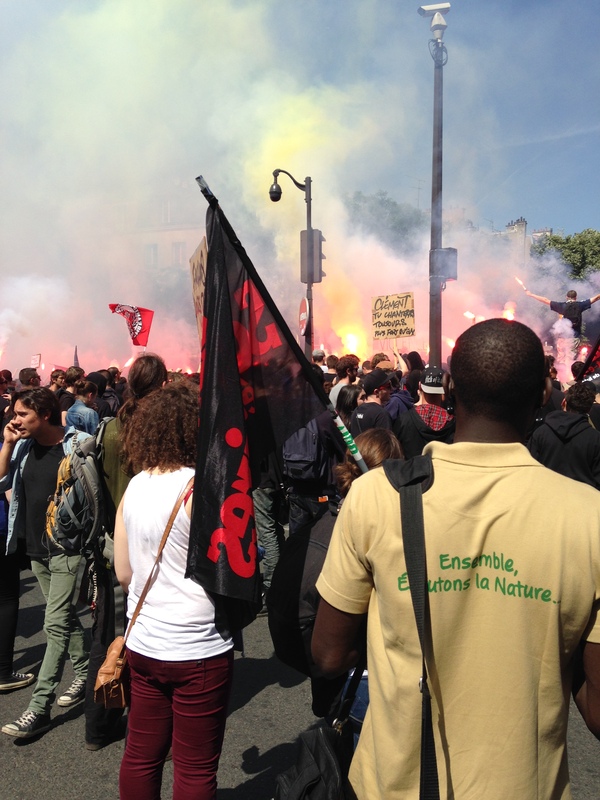 There was a lot of smoke from flares, a little trash-burning, a little glass-smashing, and an awful lot of riot police, but other than that, things weren’t particularly hairy–the French are old hands at demonstrations, strikes, and the like. manifestation: demonstration. This is such an important word in France that you learn it in French 101 in college. I include it here for the reader’s edification–it’s not a word that I didn’t know before, unlike every other word that you’ll read in this blog. la rixe: fight, altercation, brawl. 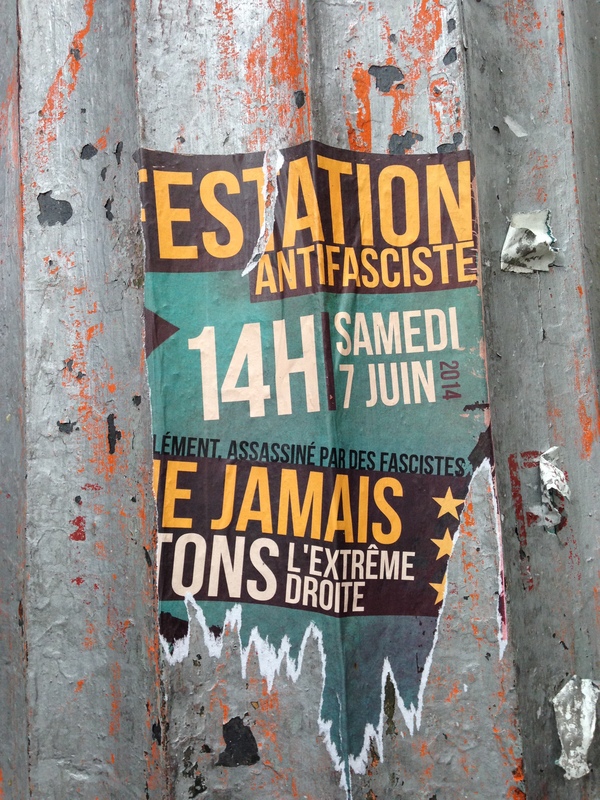 This demonstration was the one-year anniversary of the death of a French anti-Fascist activist in a rixe with some right-wing skinheads.